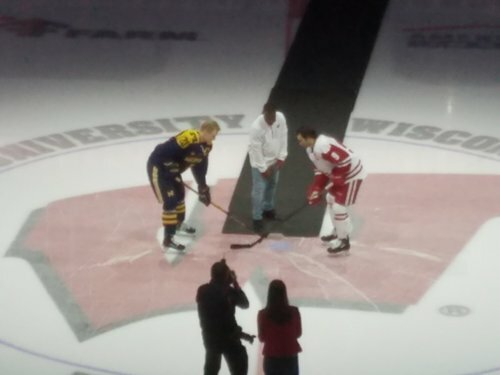 A nice chant of "MVP" up from the crowd for James White as he drops the first puck. Almost go time in Madison. 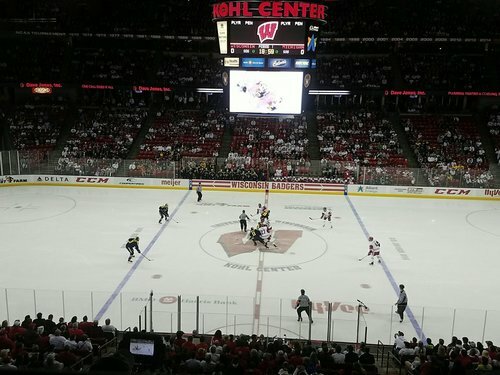 We're underway at the Kohl Center! 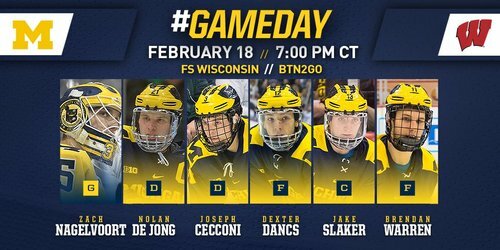 Our starting lineup tonight as we get underway in Madison. BADGERS GOAL: It takes only 8 seconds for UW to grab a 1-0 lead, and it's Trent Frederic again. WOLVERINES GOAL: And both teams have a goal in the first 43 seconds as James Sanchez equalizes. Sanchez for his 5th of the year! Less than a minute into the game and both teams find back of the net. Michigan adds another one to make it 2-1. 15:20 left in the period. WOLVERINES GOAL: Cutler Martin scores from the left circle and Michigan leads UW 2-1 with 15:20 left in the first. 11:31 left in the first and the Badgers trail 2-1. Michigan is leading SOG 4-3 in the early going. 11:31 left in the first, Michigan leads UW 2-1. Shots on goal are 4-3 for the Wolverines. @Cutler88Martin with a snipe off a beautiful ???? from @nikoporikos ! Frederic's goal 8 seconds into the game beat the previous UW record by 1 second. Wagner, Reinprecht, G.Winchester all scored at :09. CLIP: Michigan's first goal of the game by Sanchez to even score at one apiece! Badgers will have their first power play of the game with 6:15 left in the period as Michigan is called for holding the stick. Michigan's De Jong goes off for holding the stick. UW gets the game's first power play. 6:15 left in the first, 2-1 Wolverines. 6:15 1st | De Jong called for holding and U-M's PK unit will go to work to try to preserve the early lead. Nothing to show on the UW man-advantage and they still trail 2-1 with 4:09 left in the first. 7-6 Badgers in SOG. Michigan kills the penalty. 4:09 left in the first, Wolverines lead UW 2-1. McGuire is called for hooking and the Badgers will send out the PK unit for the first time tonight with 3:09 to go in the period. UW's McGuire is called for hooking with 3:09 left in the first. Michigan on its first power play. CLIP: Michigan's second goal of the period to take 2-1 lead -- this one from Cutler Martin! BADGERS GOAL: Trent Frederic with his fourth of the weekend, this one short-handed, and it's 2-2.